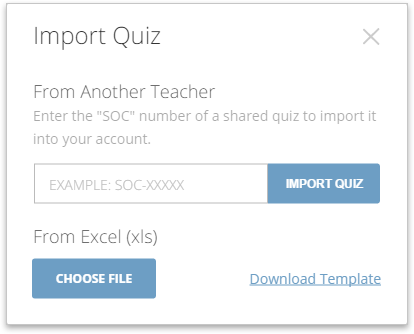 On the Import Quiz dialog, click the link for "Download Template". Open the downloaded “socrativeQuizTemplate.xlsx” file in Microsoft Excel or an Excel-compatible spreadsheet program and follow the embedded, numbered steps. Enter the name of the quiz. In the Question Type, select either “Open-ended” or “Multiple choice”; if you're typing this manually, please keep in mind that these are case-sensitive and must be entered exactly as shown in order to be recognized by Socrative. Enter your question in the associated field. If you selected a multiple choice question, provide your answers in Answer columns A-E. In the final five columns, indicate one or more correct answers (e.g. A, C, E); if the question is open-ended, these are optional and may be left blank.Note: Students must select all the correct answers in order to be scored correct. When you are finished creating your quiz, save and close the Excel file. 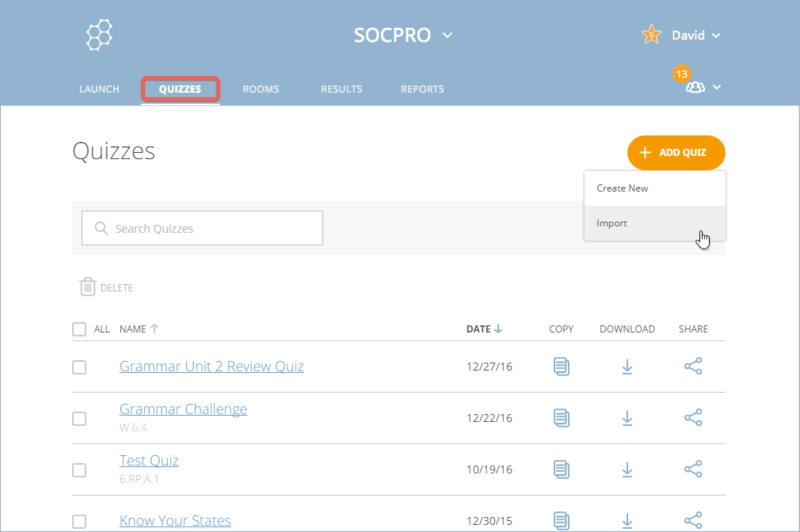 Click here to learn how to import your quiz into Socrative. Note: If your Excel file contains any errors, Socrative will notify you during the import.